Remember how I was talking about that book on DIY weddings that I had checked out from the library? It inspired the wishing stars, which I originally put on this soap dispenser cover. I was so happy with how it turned out that I've gone ahead and made a whole wedding set. 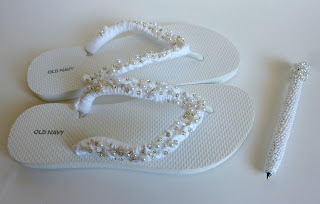 My Wedding Wish set includes ornament favors, a guest book pen, and comfy wedding flip flops for the reception/honeymoon. 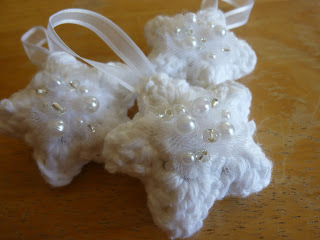 Like I mentioned before, I just adore the idea of making an ornament favor to give to wedding guests. I love the hand-crafted aspect of the favor, and I love that it's something that guests could treasure for years to come. Make a Wishing Star using the worsted weight yarn and size G hook. Before you sew the 2 sides together, decorate the front piece with the tulle and beads. I began by cutting a small circle of tulle and tacked it to the center of the star piece. Then I hand sewed an assortment of plastic pearl beads and glass beads to decorate the star on top of the tulle using a sewing needle and thread. Hide knots on the back of the piece. Then using yarn and yarn needle, whip stitch the two sides of the star together, leaving the top point of the star unstitched. Weave in end and fasten off yarn. Stuff the star with fiberfill. I used a 3" piece of ribbon for my hanger, but you are welcome to use a longer piece if you would like. Make a loop with your ribbon and insert the ends in the open top of the star. Pin in place if desired. Using a needle and thread, stitch the top point of the star together, being careful to catch the ribbon in your stitches to attach the hanger to the star. Fasten off the thread with a small knot and hide the ends invisibly. Snip off any excess thread. When I first envisioned my pen covers, I imagined that a covered pen would make a gorgeous guest book pen at weddings. I also am enamored with the idea that it's a special pen the bride could use afterwards as a special reminder of her special day. I made a the cover with my Fancy Pen pattern. I finished the pen completely, weaving in all the ends, before I began sewing the beads on to the top inch and a half of the pen. I used a doubled piece of thread, since I wanted the beads to be stitched on sturdily. I randomly attached the beads, using the pearls beads as the focal pieces, and filling in with the small glass beads. 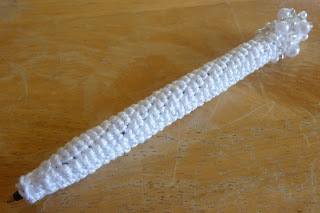 Fasten off the thread with a small knot and hide the ends invisibly. Snip off any excess thread. Okay, this is my favorite project from my wedding set. 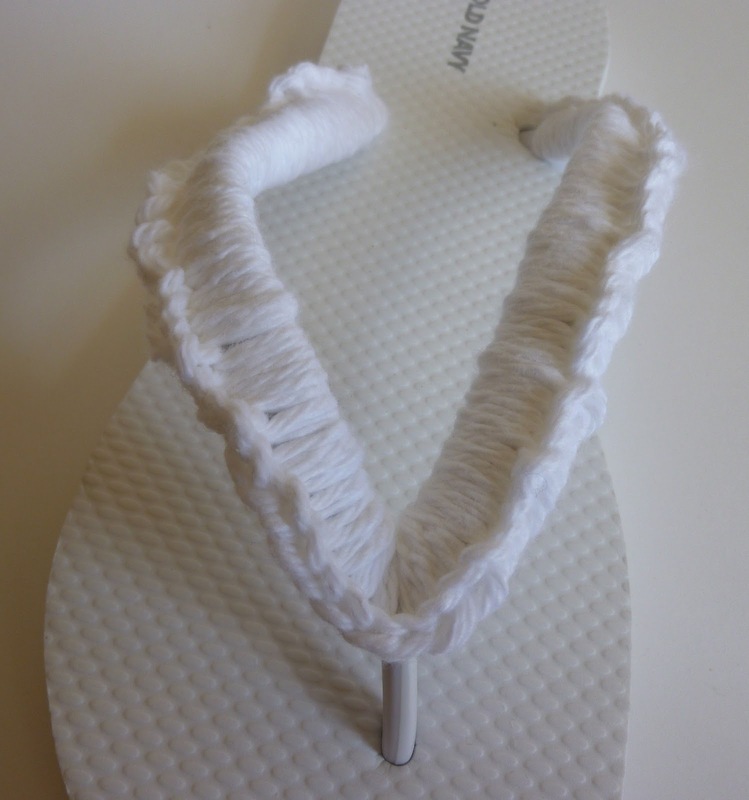 There are a ton of tutorials all over the internet on how to cover the straps of your flip flops in single crochet. I knew that if I wanted to make some flip flop covers, I needed something special. Something a little more glamorous. The crochet design is simple, and the same as everyone else out there, but what we're going to do afterwards is what's going to take it from "Uh..." to "Ooooh!!!" Trust me. 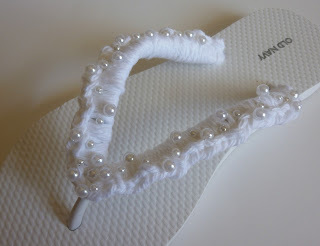 I used the worsted weight yarn and single crocheted around the strap of the flip flop. I really smooshed the stitches together to make sure that no part of the strap would show, and to give myself a good base to stitch the beads on to. I used the larger pearl beads and sewed them to the top of the strap with a doubled piece of thread so that they were extra sturdy. I used about two dozen of the large beads. I alternated which edge I stitched them to, and I sewed them about a 1/2" apart. I added extras at the toe-strap V, since that part is going to show the most. Next I sewed the smaller pearl beads to the top of the strap. I added a small pearl bead between each large pearl bead, and one on each end, which will give it a sort of zig-zag effect. It took 26 small pearl beads. Then I went in with the glass beads and just added them wherever there was an empty space. 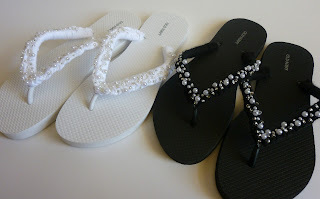 I really wanted to create the illusion that the top of the flops were jewel encrusted. I paid special attention to making sure that the single crochet edge of the cover was included in the beading to break the line up and make it more difficult to figure out how the flip flops were made. When you feel like the flops are adequately bejeweled you can fasten off the thread with a small knot and hide the ends invisibly. Snip off any excess thread. These are my finished flip flops. You don't have to feel limited to the bead choices that I made. 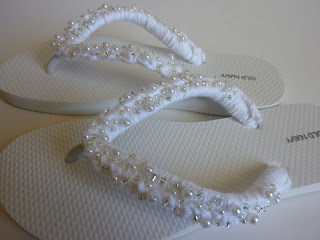 If your budget allows, I would highly recommend adding Swarovski crystals to the mix. It would be super cute to add a blue crystal as a something blue, if you need one. 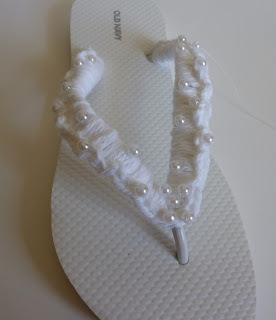 I think that it would be super sweet to make pairs of reception flip flops for your bridesmaids and The Moms. Everyone's feet hurt from pinchy shoes by that point of the day. I made the black pair the same way as I made the white, except I used black yarn to cover the straps. You could make them to match your wedding colors, and your bridesmaids would be super grateful! Of course, you don't have to be planning a wedding to make these. I pretty much live in flip flops, so I'm planning to wear these as just regular footwear. Cheapy dollar flops aren't really my style, but these are so well disguised I would be comfortable wearing them everywhere. Okay, Dynamos, I'm off for the day. But I'll be back on Wednesday, with a giveaway!!! So come back to get in on the fun! Thanks Mom! I've got a ton (!!!) of beads left over if you want to decorate a pair. The flip flops are WICKED COOL!!!!! Thank you so much Sue!!! I'm thrilled with how they turned out, and they won't rub a raw spot on the top of my foot now! Bonus cool! Thanks for checking them out! Wonderful ideas Jaime! Love the flip-flops! Hi Kimberly! Thank you so much! And thanks for the wonderful write up on CraftGossip! I really appreciate it!! 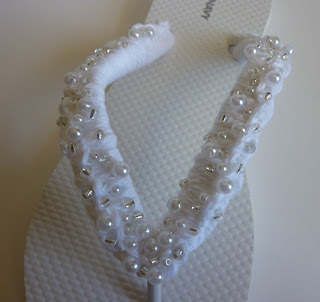 I think flip flops is a wonderful idea for wedding wishes.I like this idea. Thanks for checking them out, Johny! Hi Sharon! Thanks! 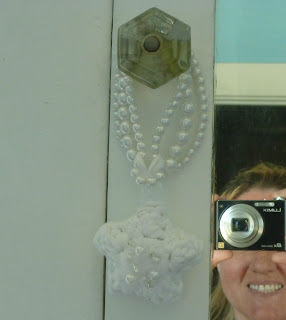 The wish stars actually are still hanging in my upstairs bathroom. I love them! I love them! I want some pretty white ones without having to get married hehehehe!! These patterns are stunning! My daughter is getting married on the beach next month! These will be perfect for her!